1990’s A Passage of Stars is the first volume in Alis A. Rasmussen’s Highroad Trilogy. 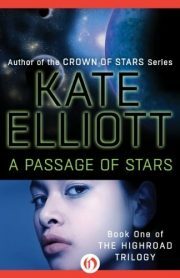 A Passage of Stars was her second published work after The Labyrinth Gate . It is therefore a very early work in a career that has thus far spanned four decades and at least twenty-five novels. Many of you may be familiar with Rasmussen’s work under the pen name Kate Elliott. Lilyaka Hae Ransome is one of the Reft’s lucky few, born into comparative wealth rather than poverty. She doesn’t see it that way. From her perspective, she’s very hard done by indeed. People of her class are expected to put their personal interests aside in the interests of the family and there will be no exception for Lily. So, no more martial arts from a teacher her family is convinced is not the right sort. Instead, she can look forward to an unrewarding career. That’s the plan, anyway. The plan gets tossed out the window when Lily sees her martial arts teacher kidnapped by aliens.